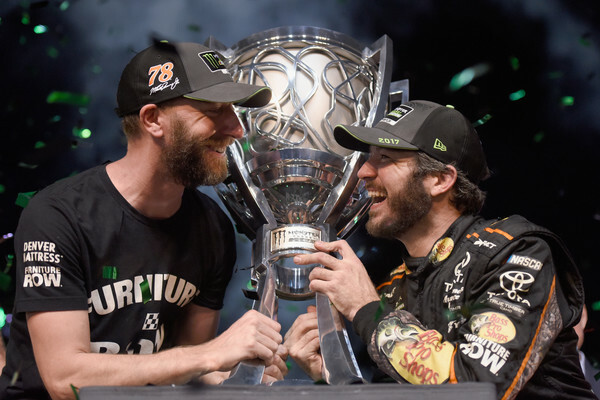 Martin Truex Jr. didn’t think about what being a Monster Energy NASCAR Cup Series champion would feel like prior to the Ford EcoBoost 400. He didn’t think about it during Sunday’s event either. It wasn’t until the Furniture Row Racing crossed the finish line for the eighth time this season that the 37-year-old got emotional. “I couldn’t even talk,” he said. “I was a wreck thinking about all the tough days, the bad days, the times where I thought my career was over with, the times when I didn’t think anyone believed in me. But the guys who mattered did — my fans, my family and then when I got with this team. Despite being the team to beat throughout the 2017 season the No. 78 team was looked at as the underdog, looking to defeat the odds for a storybook-type ending. And they did. Time after time after time. The result ending with Truex earning his first career MENCS championship with eight wins, 19 top-5s, and 26 top-10 finishes. “Honestly, it’s just a lot of love on our team,” said (crew chief) Cole Pearn. “We all believe in each other and believe if you live your lives right, good things will come. We’ve been together a long time and we battle like brothers. All I did the last few laps was think of my friend Jake and his family. Sherry Pollex, Truex’s longtime girlfriend, reaffirmed that statement. The conclusion of the finale at Homestead potentially marked the ending of three full-time Cup drivers. Dale Earnhardt Jr., who announced his retirement in April, finished 25th in his last race. The 14-time winner of the Most Popular Driver award ends with 26 career wins, including two victories of the Daytona 500 (2004, 2014). Matt Kenseth, who is being replaced at Joe Gibbs Racing by Erik Jones, finished eighth. Kenseth doesn’t have a ride for 2018 and has stated he is not actively looking, however he will not call it a retirement. Danica Patrick finished 37th in a 39-car field in what will be her second-to-last start. Patrick will race in the 2018 Daytona 500 and the Indy 500 before calling it quits. Kyle Busch finished second to Truex, followed by Kyle Larson, Kevin Harvick, and Chase Elliott. Brad Keselowski finished seventh.